Other works by Murray include Stomping the Blue, a novel which appeared in 1976, Good Morning, Blues: The Autobiography of Count Basie which was a collaboration with Count Basie released in 1985, the 1991 novel The Spyglass Tree, collections of essays in The Blue Devils of Nada (1996), and Trading Twelves: The Selected Letters of Ralph Ellison and Albert Murray which appeared in 2000. Stomping the Blues won the Deems Taylor Award given by the American Society of Composers, Authors, and Publishers in 1977. In 1997 the Book Critics Circle gave Murray its lifetime achievement award. The following year he received the inaugural Harper Lee Award as Alabama’s most distinguished writer. Murray’s Trading Twelves: The Selected Letters of Ralph Ellison and Albert Murray, which he edited with John F. Callahan, appeared in 2000. That same year he appeared as a commentator in Ken Burns’s multipart PBS documentary, Jazz. His last novel, The Magic Keys, was published in 2005. 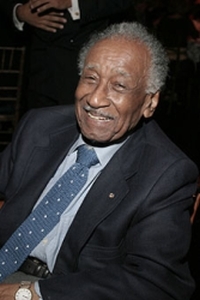 Albert Murray died in his Harlem (New York City) home on August 18, 2013. He was 97. Albert Murray and John F. Callahan, eds., Trading Twelves: The Selected Letters of Ralph Ellison and Albert Murray (New York: The Modern Library, 2000); Roberta S. Maguire, Conversations with Albert Murray (Mississippi: The University Press of Mississippi, 1997); http://www.tuskegee.edu/Global/story.asp?S=1260209; http://www.search.eb.com/eb/article?tocId=9002879; Mel Watkins, "Albert Murray, Essayist Who Challenged the Conventional, Dies at 97, Books Section, New York Times, August 20, 2013.